^ Borucki, W. J. et al (2009). “Kepler's Optical Phase Curve of the Exoplanet HAT-P-7b”. Science 325 (5941): 709-. http://ads.nao.ac.jp/abs/2009Sci...325..709B. ^ Borucki, W. J. et al. (2010). 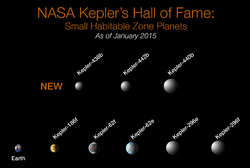 “Kepler Planet-Detection Mission: Introduction and First Results”. Science online. doi:10.1126/science.1185402. ^ Boyajian, T. S. et al. (2015年9月11日). “Planet Hunters X. KIC 8462562 Where's the flux?*”. arXiv:1509.03622v1 [astro-ph.SR].